"These spicy tacos with corn contain KELLOGG'S* RICE KRISPIES* for a smooth, rich texture in this crowd-pleaser with any or all of your favorite toppings." In large skillet, cook ground beef and onion over medium heat until meat is browned. Stir in corn, tomatoes, ketchup, cereal and seasonings. Simmer over low heat about 10 minutes, stirring frequently. 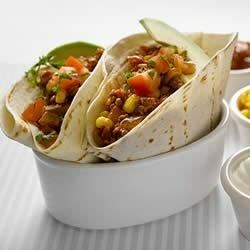 Warm tortillas in oven or microwave. Spoon 125 mL (1/2 cup) meat mixture onto each tortilla. Add toppings. Serve immediately. Place uncrushed cereal and all ingredients, except toppings in food processor. Process about 30 seconds until mixture is crumbly. Continue as above. Whenever cooking with raw meats, ensure safe internal temperature is reached. In keeping with good allergy practices, we remind you to be aware of allergens and to check labels on any packaged goods used. This recipe has been tested using Kellogg's* products. Results with other products may vary. *© 2008, Trademark of Kellogg Company used under licence by Kellogg Canada Inc.